For at least 3,000 years, the Chinese have organized the world around them using a special system they developed which divided time and space into units of twelve- in the form of an ordered set of symbols which they called the SHI ER CHI (十二支). The earliest extant evidence of the use of this system can be seen in fragments of tortoise shell which were unearthed by archaeologists. These were engraved with characters designating these units, sometime during the Shang Dynasty (1766 BC and 1122 BC) . Many centuries later, during the Han Dynasty (206 BCE – 220 CE ), each of these 12 units came to be asscociated with a specific animal. Some scholars suggest that this occured possibly because of the influence of the Greek zodiac, which the Chinese might have come to know via India. But no matter how or why a set of animals came to represent each of the twelve units, this concept has added plenty of symbolic depth (and appeal) to the system, since the unique characteristics of each of these animals could be used for fortune telling ( not unlike the astrology which developed in Europe- except for the fact that in the Chinese system everyone born in the same year had the same sign!) and also, quite importantly, artists and craftmen had animal motifs (so rich in possibilities) to work with each year ( in cycles of twelve). Since in days of old, Japan was influenced by nearly all things Chinese, it is only natural that this system used for designating years, months, days, time of day, and direction was adopted by the Japanese. This happened officially during the reign of the Empress Suiko in the early 7th century. Over the subsequent centuries, this system- called ETO, or JU-NISHI in Japanese, gained terrific popularity ( because of the fortune telling and decorative opportunities I have already mentioned)- especially in the Edo Period (1600-1868). Even after the Japanese abandoned their old calendar and started using the Western (Gregorian) system, they have still clung firmly to the Chinese Zodiac.In fact now it might be more to be more popular than ever. So while the Chinese, with their traditional calendar, are still in the Year of the Tiger ( until February 3rd 2011), in Japan, where the new year now begins in January,　we have already entered THE YEAR OF THE RABBIT. With cleverly designed rabbit motifed decorations on display just about everywhere over the past few weeks, I have had rabbits on the mind. Let me share with you some of what I find particularly interesting about RABBITS IN JAPANESE HISTORY AND CULTURE, and also about Japan`s wild rabbits (hares, in fact)- especially those right here in Tsukuba ( where they are still plentiful). Rabbits, so cute and gentle, so furry, soft and warm are one of the animals which the Japanese are most familiar with. Not only are they popular pets ( there was a veritable house-rabbit craze in the Meiji Period), but most schools and kindergartens keep them ( in a pen outdoors), to teach kids about resposibility and caring for living creatures. Besides being symbols of peace, docility and cuteness, they are also considered to be lucky. 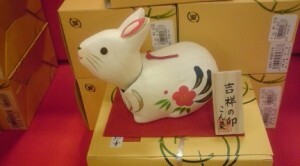 This is because the Chinese character usually used to write this animals name- 兎　(another character – 卯, is used to represent the rabbit as a zodiac sign) is very similar to the character 免 ( manukareru), which means to get rid of, or make vanish- in other words- rabbits some believe that rabbits will make BAD LUCK DISAPPEAR. Just in the same way as when you spot a rabbit in the wild and- in the blink of an eye- ITS GONE! The only problem with this current image of rabbits is that the animal adopted as the fourth sign in the Chinese/Japanese zodiac was not exactly the rabbit ( an animal which breeds in burrows underground and which was introduced from Europe probably just before the Edo Period) but THE HARE- an animal native to Japan ( in several species) and which has played a major role in folklore and mythology. 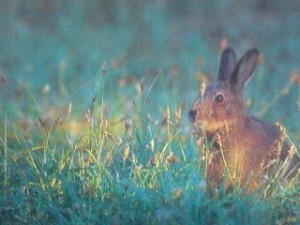 Importantly, hares were also considered symbols of fertility ( as they are in most of the rest of the world). for the reason that they breed like……. well, uhh,…. like….RABBITS ( as the phrase goes). It is because of this connection with fertility and abundant offspring that the ancient Asians ( Indians, Chinese, Japanese, etc) have long said that there is a rabbit (hare) on the moon ( in Japan it is actually pounding mochi rice cakes). When I first heard this after coming to Japan, I was really puzzled by why there should be such a story. Now, however, it seems perfectly logical to me since I have to know that THE MOON has also been considered to be deeply connected to pregnancy and childbirth. Thus, the MOON, a God of Conception and Childbirth, with a servant, the symbol of fertility- the HARE – are a natural combination. Since rabbits were associated with having children, there were various folk beliefs which existed throughout Japan linking rabbits with prayers for easy delivery. Eating rabbit meat to ensure the mother and child`s safety was customary in certain parts of Japan, while in others ( interestingly) it was shunned- in the belief that doing so would lead to the chlid being born with a hare-lip ( mitsu-guchi, 三っ口). And though the practice of eating rabbit meat before delivery ( or the belief that it should be avoided) have completely died out, there are still a few shrines around Japan which are dedicated to rabbits as messengers of the God(s), that are popular places to pray for conception and then easy delivery ( the OKAZAKI JINJA in Kyoto and the Tsuki Jinja (調神社) in Saitama City- are two of the most popular Rabbit-related Shrines). Another reason that hares have been have been worshipped at certain shrines, or in some places are believed to have the power of prophecy ( for example, predicting the weather) is because of a very famous story in Japan`s oldest text, the KOJIKI. Let me summarize it for you. 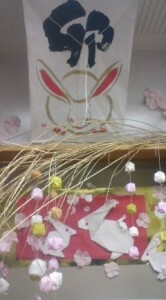 It explains how one particular rabbit/hare came to be a deity (USAGI GAMI). 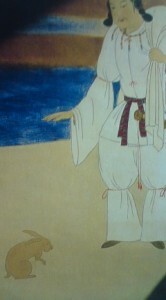 O-Kuni-Nushi-No-Mikoto ( who is one of the major figures in Japanese mythology and an important KAMI (God) enshrined at Izumo Grand Shrine in Shimane Prefecure), was carrying the baggage for his brothers, the eighty deities (八十神), who all wanted to vie for one particular maiden`s hand in marriage ( she is called YAGAMI-HIME, 八上比売). Suddenly they came across a miserable looking hare whose fur had been stripped off. The brothers tell him to wash in sea-water and then go dry off in the mountains. When he did so, he got even worse. His skin started to crack and peel. All he could do was sit and cry in self pity. O-Kuni-Nushi-No-Mikoto, asked him why he had ended up in such a state. 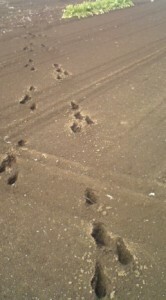 The hare explained that he had been living on an off-shore island and wanted to get to the mainland. In order to do so, he tricked a crocodile though most now translate the word used here-WANI (crocodile), as shark!) into carrying him across the sea, by challenging the gullible creature to comparing who had more relatives ( the hare is always a trickster!). When the crocodile realized he had been deceived, he ripped off the hare`s fur, and left him to suffer. Hearing this story, O-Kuni-Nushi, a great healer, suggested that the hare wash in pure water and then roll in the pollen of kama grass. The hare obeyed these instructions, and the remedy did the trick! The hare was cured. In his happy state he predicted that O-Kuni-Nushi, and not any of his brothers would marry YAGAMI HIME. This prophecy came true. And thus, the hare became the USAGI GAMI – Rabbit/Hare Deity- enshrined till today at the Inaba no Shiro Usagi Jinja Shrine in Tottori City. Another interesting Hare related myth which has led to the animal`s deification I learned about while visiting the city of Uji (famous for tea and the magnificent Byodoin Hall) in Kyoto Prefecture. At Uji Shrine I read about how the Emperor Nintoku`s son, while once fleeing for his life, was guided to safety by a hare ( what probably really happened is that he followed the trails in the bush made by rabbits or other small animals). That is why a Hare-Deity is believed to protect the shrine. Some even say that the place name UJI derives from Usagi- miCHI- Rabbit-Road!. On Sakurajima Island there lived a large hare which was believed, by the local residents, to be the deity of the mountain ( the island is a volcano). Because of that, no one there ever ate hare meat. 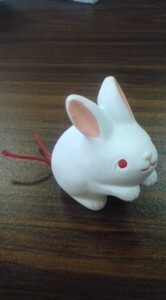 In fact, even mentioning the word hare ( USAGI), was believed to bring on a stomachache. Thus, in conversation everyone would refer to this animal as Lord Long Ears ( O-Mimi-Naga-Sama). Once a member of the Satsuma Clan ( the rulers of that region) came to island for a hunting expedition, and killed an big, old hare. The Volcano erupted. Hunting was subsequently banned. I have found that in many other parts of Japan, as well, the word USAGI was not spoken in vain. Other names were used instead. Pulling the fortune out from the rabbit`s bottom! For those of you who study Japanese, you might have come across this curious feature of the language. 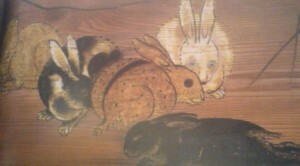 When counting rabbit/hares the word WA ( 羽) is used ( in Japanese different counting words are used for different things). The odd thing is that this is the counting word used for counting BIRDS! ICHI WA, NI WA – one bird, two birds. Some explain this by saying that is because rabbits/hares jump ( like flying) and their ears look like feathers ( and also because their meat tasted like chicken!). The real reason, however, is more interesting. Since the adoption of Buddhism, the eating of the meat of four-legged animals has been frowned upon ( though not anymore!). In fact, during the Edo Period, the Tokugawa Family officially banned the eating of such animals. 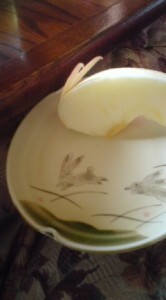 The trouble was, that the Tokugawa`s in fact loved eating RABBIT. In fact it was a regualr feature of their New Year`s Dishes ( O-Sechi). How did they get around the law that they themselves promulgated and enforced? Easy. They called hares BIRDS ! Case closed! By the way, besides eating the meat, the Japanese also used the fur, to make brushes for calligraphy. Such brushes were long considered to be The highest quality. Also, just as in the story from Uji, the hares create a series of paths through the bush which humans and dogs can use to negotiate Tsukuba`s often impassable wilds. The other day I came across the remains of a hare killed by a goshawk ( not a pleasant sight!). The hares ( no-usagi) which live on the island of Honshu ( Japan`s largest island) can be divided into two types (subspecies)- the type which can be seen in Tsukuba: the KYUSHU NO-USAGI, Lepus brachyurus brachyurus ( see picture above) which is nocturnal, eats grass, leaves, bark and freshly sprouted leaves, and usually hides in the woods or brush during the day…..
and the TOHOKU NO-USAGI, Lepus brachyurus angustidens, which is quite similar in habit and appearance, except for one astounding characteristic: these hares turn pure white in winter! Another reason why the ancients might have considered them as sacred creatures. The KYUSHU type live mainly on the eastern side of the mountains which run down the center of Japan. The TOHOKU type live on the western, snowier side. There are other varieties ( subspecies) of the Japanese hare, for example the the SADO NO-USAGI (佐渡野兎), Lepus brachyurus lyoni, which inhabits Sado Island in the Japan Sea, and the OKI NO USAGI (隠岐野兎), Lepus brachyurus okiensis, which lives on the Oki Islands ( the same islands from which the Inaba no Shiro Usagi hailed from!). 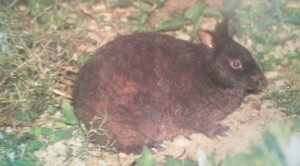 Of even greater interest is- pentalagus furnessi- the Amami no kuro-usagi (奄美黒兎)- the Amami black rabbit, a protected, short-eared species which can only be found in the forests of Amami O-Shima and Toku no Shima in the Amami Chain south of Kyushu. This creature is considered to a remnant of the rabbits which once inhabitted the Asian continent, but now only survive on these islands. I think I will take a break now. I feel guilty leaving so much more unsaid ( nearly every line Ive written could have been expanded into a story of its own ( thoughts can also breed like rabbits!) but I think its time to say …. Japanese Farmers Let Their DAIKON RADISH (大根) Chill Out in The Soil- the colder, the sweeter! Last night was a Full-moon and I could watch the rabbit, name unknown, but very famous in Japan for using a KIINE (pestle) and Usu (wooden bowl) to make Omochi. Imagination was needed because she or he was standing slantwise. One can picture his or her grey ears against the white moon.The next full moon will be ,as Avi-san mentioned recently. Japanese wild rabbits change their color from light brown to white during winter where there is snow on the ground from winter to spring like the Hokuriku area and the Hokkaido area. Raicho, a bird which lives in very high-mountains such as the Japanese Alps also change their color from brown to white during winter. Protection. Usually humans can not change their colors like this even he or she wants to. Only in the political world can one change colors so easily!! Also in that world they are running away like rabbits. I have mentioned before that I like snow, but living in a part of Japan with a lot of snowfall would be different, I am so sorry to see news that there were so many senior citizens who had accidents and died or were injured while removing snow from their roofs, especially in the Hokuriku area. In Hokkaido the shape of the roofs is much steeper and the snow is much more powder like, so there is not such a great need for snow removing. Rabbits would slip off those roofs. At the moment I am practicing a Japanese old children`s song for our male chorus, one of them is “Machibouke”( Waiting too much:Its the Story about a farmer who once got a rabbit just in front of him to be stricken at a stump of tree, then he thought if he wait again he can get another rabbit: from proverb of 韓非子（KANBISHI：Chinese ancient philosopher, Mr. Yamada Kousaku made poem in Meiji era）to admonish people not to stick to old customs too much. Rabbit raising and sheep raising in Japan has its peak during WWⅡ because of military demand of hide or wool for clothes or neck covers in winter preparation in Chinese continent. Now Japanese rabbit are kept for pet and sheep for GINGISKAN-NABE (Mongolian style of BBQ, famous in Hokkaido) or experimentally purpose. Why Western people think dried leg of rabbit is symbol of good luck? 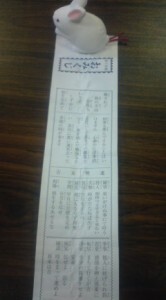 Mine is an Omamori (good luck player just like shrine made one) which my daughter made more than 25 years ago. There are 2 differences in the 12 zodiac signs between the Chinese and Japanese. In place of goat and pig, the Japanese have sheep and boar. Imagine the surprise or amusement when a Japanese friend found out that she is born in the year of pig according to the lunar calendar. I read your long blog abot rabbits. 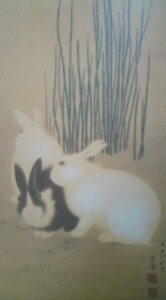 It contained many interesting informations about rabbits in Japan. The most interesting story was about the digestion. It was my first time to hear that rabbits eat their food two times.The first time removing the half digested food from their own O-shiri with their mouth. After that I was reading more about the rabbit digestion system. Thank you for always showing me new things in every day things. Thank You so very much for the wonderful information. Mamoru-San! Tonight will be the TRUE beginning of the Year of the Rabbit, according to the old calendar ( which the Chinese still use). For the occassion I re-read my post on Rabbits in Japanese Culture, as well as your comments on it. Thank you for mentioning and reminding me about the RABBIT`S FOOT, which was a popular lucky charm when I was a boy growing up in the US. To tell the truth, I had no idea what the origin of that superstition was, so Ive been doing a little checking. 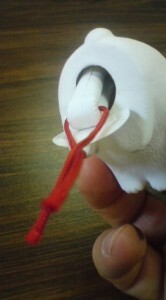 What I have found is intriguing for me, since the symbolic connections related to rabbit foot charms are similar to those that appear in traditional Japanese culture ( and in East Asian culture in general). I am referring of course to sexuality, and the moon. It seems that the rabbit`s foot was a charm which was believed to bring the bearing good luck in gambling and picking up women. 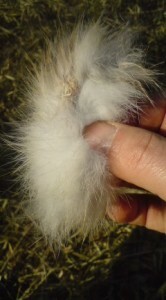 Interestingly, an authentically powerful rabbits foot ( unlike those cheap keychains which were popular when I was a kid)had to be killed in the light of the FULL MOON ( among other criteria). Like so many aspects of Japanese culture, the rabbits foot ( and other elements of american culture) show multiple and diverese roots- in this case CELTIC and AFRICAN. Thanks for reminding me about those furry lucky charms. It brought back memories. Keep your ears open tonight for the FIREWORKS which will surely be set off by some of the many Chinese residents in this area.